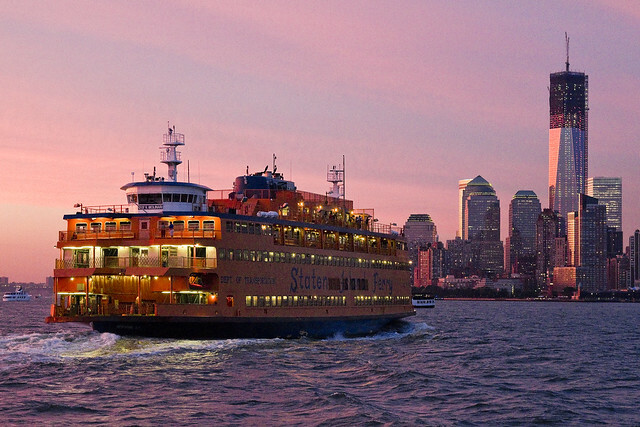 That’s the Guy V. Molinari, part of the Staten Island Ferry fleet, in a shot from 2012. The boat is the first of its class and design, and the photo above is a fairly typical rendering of what you’d normally get to see of the boat, sans the atmospherics and dusky lighting, which was pure serendipity for a humble narrator. 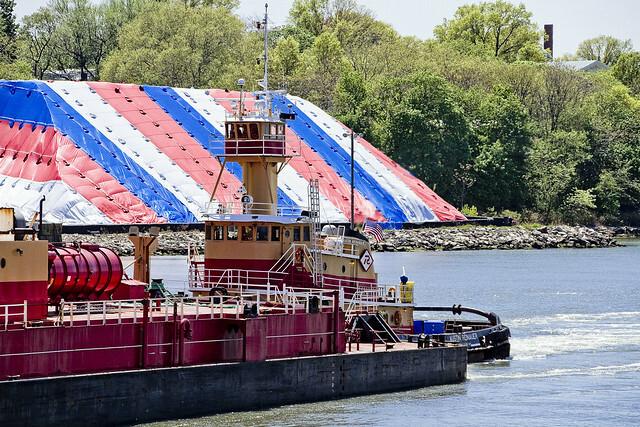 The other day, while onboard a slow boat cruising along the Kill Van Kull, I was looking at the Caddell Dry Dock facility and what do I see floating there but the Guy V. Molinari up on jacks. 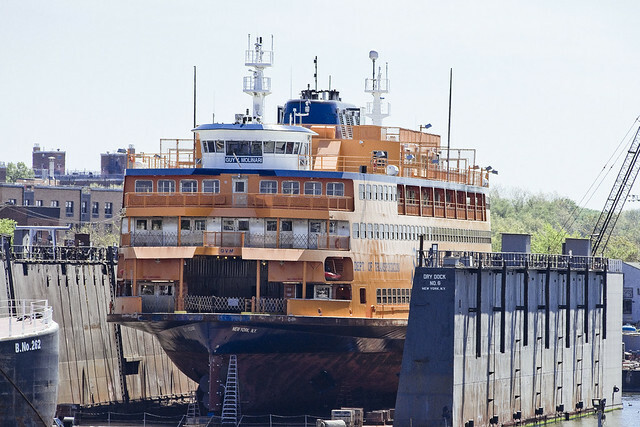 For you longtime readers, I’ve mentioned Caddell before, but if you need a refresher course – click here for a 2012 post about the company and their floating dry dock business. Just for giggles, here’s another one from 2014 when the USS Slater was there. 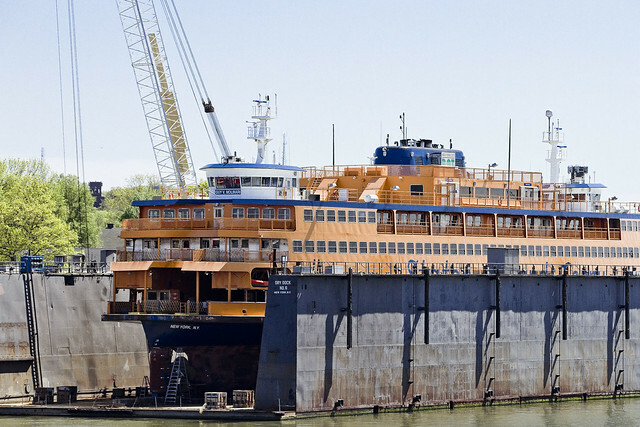 The MV Guy V. Molinari, MV Senator John J. Marchi, and MV Spirit of America, known as the “Molinari class”, carry a maximum of 4,427 passengers and up to 30 vehicles. Each boat is 310 feet (94 m) long by 70 feet (21 m) wide and has a draft of 13 feet 10 inches (4.22 m), tonnage of 2,794 gross tons, service speed of 16 knots (30 km/h), and engines of 9,000 horsepower (6.7 MW). For those of you who didn’t bother to click through, a floating dry dock is a maritime structure capable of submersing part of its superstructure, allowing vessels to inch into it. The floating dry dock then rises back up, picking up the vessel with it. This allows free floating structures to be lifted out of the water so that workers can perform maintenance tasks on the hull and other normally inaccessible areas. One has seen a lot of things over the years on NY Harbor: the nose of a submarine being barged under the Williamsburg Bridge, an experimental military attack boat at Hells Gate, a space shuttle dangling from a crane, the list goes on and on. 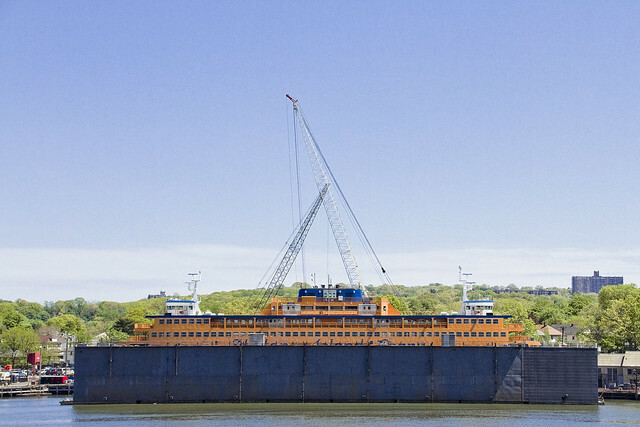 I’ve never seen a Staten Island Ferry up on blocks before. 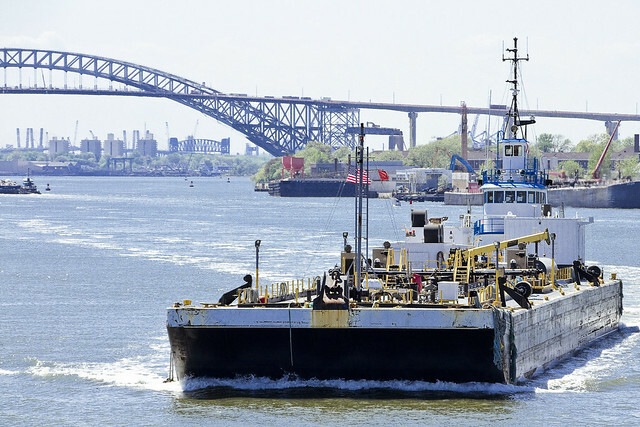 As a note, scenery like the stuff you’re looking at today will be on display the evening of May 17th when I’m on the microphone for Working Harbor Committee’s Newark Bay tour, ticketing link at bottom of post. Come with? As always, Kill Van Kull was putting on the maritime industrial tour even as the boat I was on headed back out towards its eventual port of call on the Hudson River side of Manhattan Island. The whole Bayonne Bridge reconstruction project seems to be winding up, and there were crews demolishing the old concrete piers which supported the original roadway. Looking forward to spending a bit more time on the water, a humble narrator is. I never got to take that vacation I was moaning about all winter, probably the best I can do for the summer is to try and not be on solid land as much as I possibly can be. May 12th RESCHEDULED for June 9th – Exploring Long Island City – with NY Adventure Club.